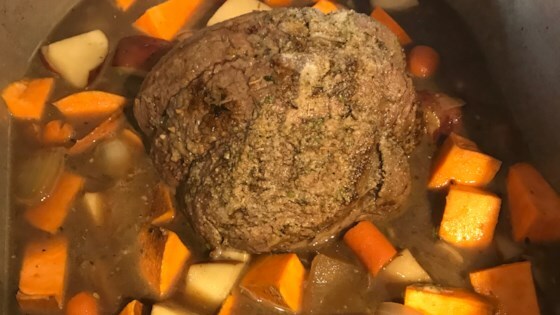 "Good, old-fashioned pot roast prepared on top of the stove!" Heat the oil in a heavy, cast iron pot over medium heat. Dredge the roast in the flour, shake off the excess, and brown in the hot oil on all sides. Stir in the onions, carrots, celery, garlic, and allspice; cook till lightly browned. Pour in the red wine and bring to a simmer before pouring in the beef broth. Reduce heat to low, cover and cook until the beef is tender, about 2 to 3 hours. When the meat has finished cooking, remove to a cutting board, and allow to rest for 10 minutes. While beef is resting, thicken the cooking liquid with the cornstarch. Slice the beef and serve with the gravy. not enough flavor at all for our liking....soooo boring even for a pot roast, what was i thinking?! Meat turned out super-tender after 3 hours. Subbed potatos for celery though and it came out incredibly. Very good. Much better than the recipe I used to follow for pot roast. I add potatoes and substitute bay leaves for the allspice. Eliminate the allspice and add 3 bayleafs, some canned tomatoes and a tablespoon of paprika for that traditional North Eastern dish.